A 26ft (8m) whale that beached on a mudflat off the south coast of England has been put to sleep with a lethal injection, rescuers said. The Northern Bottlenose, which has suffered kidney failure, became trapped in Langstone Harbour, off Hampshire, on Thursday and beached overnight. Rescuers had suspended an attempt to issue a lethal injection because the mammal swam back out to sea. But after it beached again, medics put it to sleep at about 1845 BST. Faye Archell, director with the British Divers Marine Life Rescue, said the whale was administered with a fast-acting fatal strength anaesthetic, called Immobilon. "The decision has been made based on medical grounds," she said. "It's the right decision for the whale. It's sick and distressed and it has come in for a second time. It has chosen to strand both times. "We now know it's not a navigational error but it has stranded for a reason, it is sick." A post-mortem examination will be carried out and samples will be sent to laboratories around the country for testing. The body will then be disposed of either out at sea or in a landfill site. Experts warned if the six-tonne mammal carried on swimming in deeper water it could take up to two days to die naturally from renal failure, which had been confirmed with a blood test. Earlier, the whale was freed from mudflats using a special lifting pontoon but it remained in shallow water. An operation to try to save the whale, believed to be a young adult, began on Thursday. 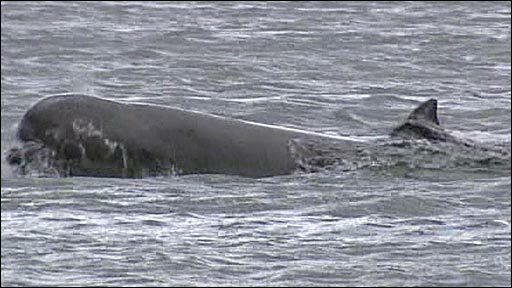 The whale ended up about 3,000 miles (4,828 km) off course due to its illness, experts said. Dr Paul Jepson, a vet with the British Zoological Society of London, said: "When it's too shallow to feed, they become dehydrated, and they become weakened and that's the problem. "Then they strand and get the muscle damage. It's a picture that we're increasingly recognising now, the more we investigate these strandings. "It may originally have been part of a pod, a larger group." 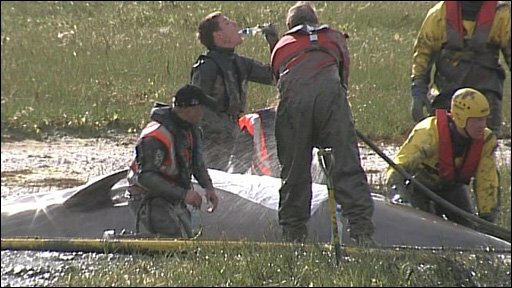 Stephen Marsh, an advanced marine mammal medic with BDMLR, told BBC News many people had worked to save the whale as well as two specialist vets. About a dozen firefighters, police, coastguards, the Ryde Inshore Rescue Independent Lifeboat and Hayling Island harbour staff took part in the rescue attempt. The species feed on deep-sea squid, which are not readily available in the English Channel. It is the same species of whale as one that died despite a massive rescue attempt to save it when it swam up the River Thames in January 2006.